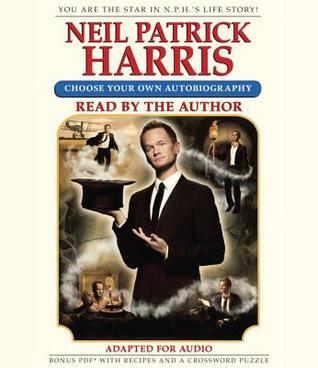 In this revolutionary, Joycean experiment in light celebrity narrative, actor/personality/carbon-based-life-form Neil Patrick Harris lets you, the reader, live his life. Even better, at each critical juncture of your life you will choose how to proceed. Choose correctly and you’ll find fame, fortune, and true love. Choose incorrectly and you’ll find misery, heartbreak, and a hideous death by piranhas. This was clever, original, funny, occasionally R-rated and, above all, entertaining. It’s written in the form of a ‘Choose Your Own Adventure’ book and you, the reader, decide what path to take next. Some of the ‘alternate endings’ to Neil’s life were laugh-out-loud hysterical, often ending with a failed career choice or his untimely death. For those who like celebrity gossip there are nice stories about Elton John, a crazy story about Anne Heche and a funny – or maybe scary – one about Scott Caan, to name a few. Other than a little too many magic tricks – not much fun in audio – it was a delight. Neil narrates his life story as only he can, and often talks about himself in the second person. The audiobook is arranged slightly different from the print. Since the listener can’t choose what page to jump to, we instead listen to each scenario and then after a slight pause Neil tells us what’s up next and to stay tuned for more. A very entertaining 7 hours and an easy listen. This sounds like a lot of fun but I think I might like it better in print. I have this in print form but was curious as to how it would work in audio. I might have to get this as well as I think it sounds like a different experience than the book. Thanks for sharing!